The Monte Carlo Rally has been one of the more durable testing grounds when it has come to the humble family car. Started in 1911 it has weathered the years and two world wars to retain a reputation of being one of the most demanding car trials in motorsport. In actual fact the start of modern motor racing was a type of rally where contestants would race from one town to another and complete only the one circuit. Somewhere along the way the two disciplines separated and we inherited the rally as we know it, and circuit racing. Post WW2 things became more technical and more cunning for this type of racing. No more fill ‘em up and go, but a little more finesse where cars raced in their own classes and even if you couldn’t manage to win a race outright, there was still the possibility of a class win. You can still buy the 'T' shirt! 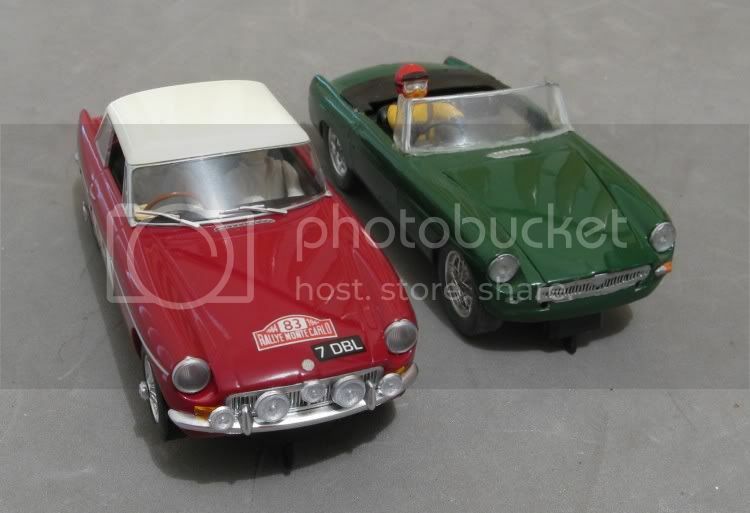 This is where Scalextric’s MGB comes in to play. 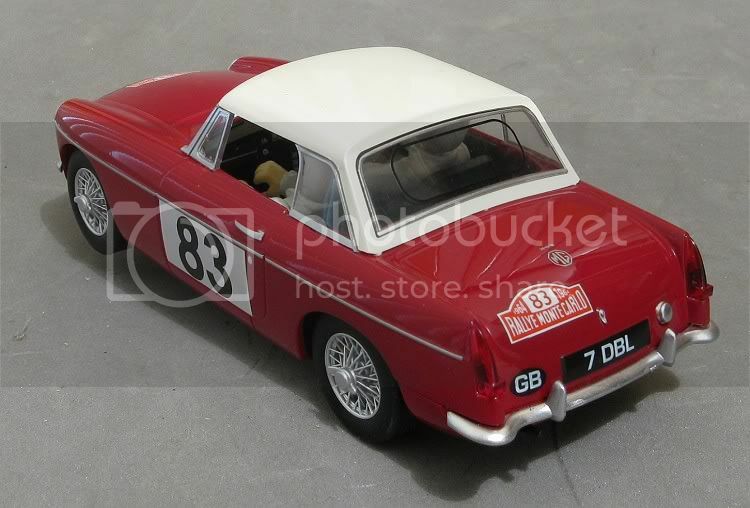 They have modelled this car on a very real MG which spent a couple of years in a couple of guises. One minute it was being driven headlong around the Le Mans circuit, where, at the hands of inimitable Irishman Paddy Hopkirk and co driver Alan Hutcherson, the car was driven to a 2.0 litre class win and twelfth place overall. Lucky really, as it spent more than an hour in a sandbank at the end of the Mulsanne straight! In fact, it was the only 2.0 litre class car to finish! There were several 2.0 litre Porsches entered but all of them collected a DNF for their efforts. At this particular event the car sported a ‘fast’ front and aluminium panels to help it along. In another incarnation, the car appeared at the 1963 Sebring 12 hour race. But, the race distance proved too long for the car and it too collected a DNF!! To cap it all, the car entered the Tour de France the same year only to crash on day 9. 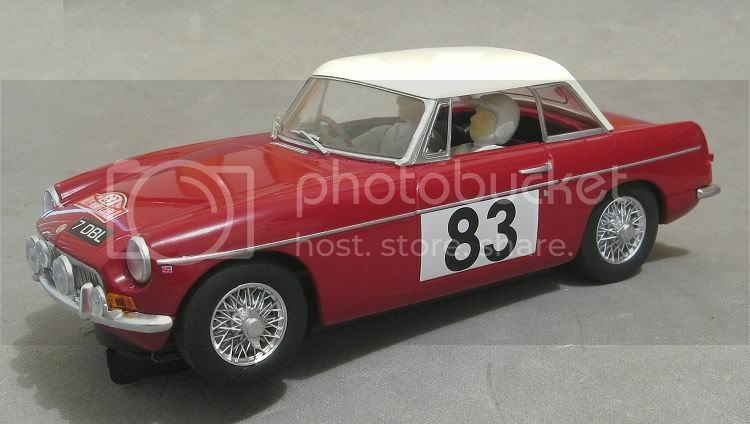 The following year, and re-equipped with the standard MGB front end bodywork, the car fell into the hands of the Morley brothers (which this model depicts). Their aim was to race it in the 33rd Monte Carlo rally, and, starting from Oslo in Norway, they set themselves a task and a half. They eventually finished the gruelling rally 1st in the GT class and 17th place overall, and put up some good times in some of the special stages. This year, Paddy Hopkirk was to be the victor in another of BMC’s products. So Scaley have done a bit of homework and presented us with a meaningful model and not an also ran which often happens with other makers. I couldn’t help noticing on the display case that Scalextric had included a little magnifying glass on the features strip on the front of the plinth. There was no mention of it on the features key on the back of the box so I went to Mr Scalex’s website in search of it. Sure enough, this indicates a model is ‘super detail’! and to be honest with you, it really is super detail. The model is part of their ‘Classic Collection’ and as such there will probably be more models adorning display cases than on the track. Scale is good if not spot on. 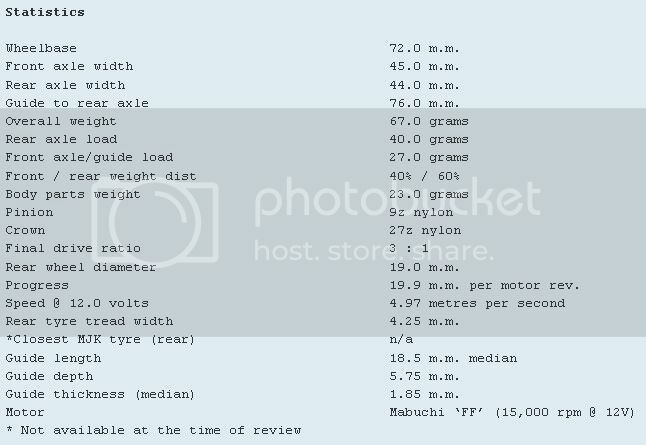 I have an Airfix MGB I motorised some years back and this is the same dimensions throughout. The first impression is that this is another shiny car and those are the sort of models I like, and getting closer we can see that Mr Scaley has spent an inordinate amount of effort making sure the ‘Super Detail’ is super. The model sports a reproduction of the resin hard top which was an aftermarket item back in the sixties. A nice touch here too is the anti mist panel on the back screen. Most cars didn’t have heated rear screens back then, and the solution was to mount a plastic oval on the rear screen. This was a bit like fitting double glazing and you relied on the air pocket created to stay clear, but it didn’t always happen! 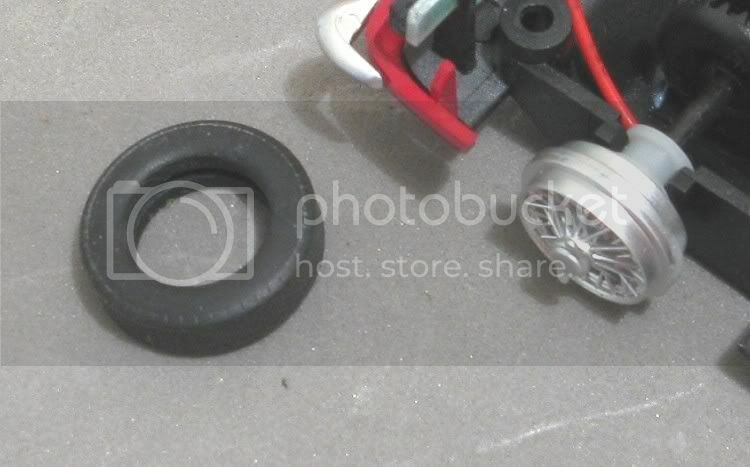 Scalextric have also gone to great trouble with other detail. 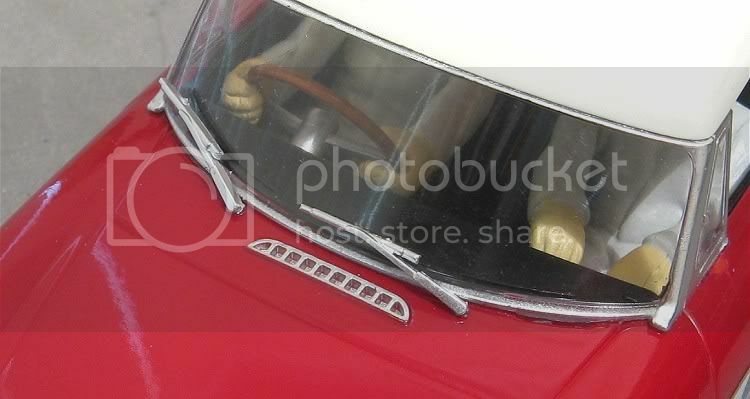 Wiper arms are almost believable and apart from anodising such things as the heater air intake grille and the windscreen seal trims, they have even picked out the hinges for the side ¼ glasses. 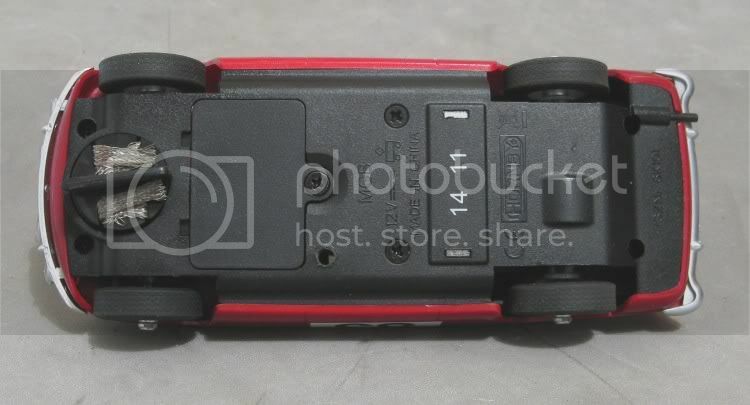 Because the model has the smaller FF motor in it, it has allowed them to put a good sized driver’s tray in the model and it takes two looks before you realise there is a motor there. The drivers tray is also typically Scalextric in that it clips into place. But unlike earlier models it looks a bit fragile and I would refrain from attempting to remove it. 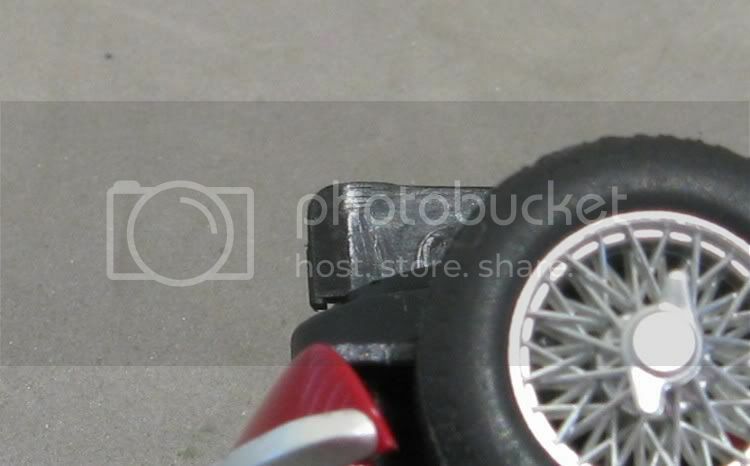 Lastly on the outside are the wheels and tyres. These are true scale too and set the model off well. Tyres are the thinnest I’ve seen in a good while but as the track test will reveal later, they do their job well. The wheels are a little thin on material around the spokes area and I recommend that all the time you leave them alone they will be fine. If you are a compulsive wheel remover, remember these are mounted on knurled axle ends; and I can confidently say that trying to remove and refit them for whatever reason will surely see them end up in the waste bin! 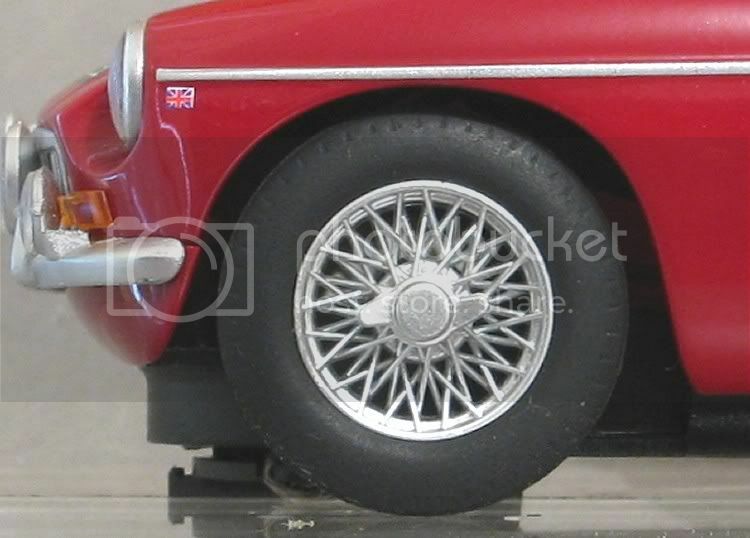 And whilst on the subject, although they are concentric, there seems to be a little bit of runout on the rears. Maybe the tyres? Mmmmmm? Just looking at the motor for a minute, like most of the FF motor models, there is a small sleeve over the pinion shaft. This allows a standard contrate to be used in conjunction with the smaller motor shaft. In most cases this sleeve is fixed in place. But I have experienced them being loose, and if the motor is removed for any reason i.e. to replace a damaged pinion, the sleeve can become inadvertently detached, and because it is such a small item, it could become lost forever amongst the dog hairs and detritus! Looking further round the model we come to the underneath, but all that is there is a neat chassis and guide assembly. I remember when Scalextric first started using this type of guide. The furore could be heard as far away as Iceland. But the reality was it soon became a guide which has probably been more useful and useable than the earlier guides it replaced! There has been one improvement though. Many of us will remember how the early V8 supercars used to jam in the tight bends on Scalextric and SCX track. On this model Mr Scaley has actually chamfered the leading edge of the blade??? Was this to alleviate this problem?? Mmmmmmmm? Next step is to open the model up and see what we are getting for our money, and the SCM’s will see what they can rip out and how much space there is to fit a host of Slot.It parts!! Inside the model a little thought has gone into the lighting system. The lighting boards these days are a bare minimum and front and rear boards are fixed firmly in their mounts. Scalextric have fitted yellow glowing front leds to this model. For Monte Carlo, French law would have required cars to have what were popularly known as sodium bulbs, which had a yellowy-orange tint to them. 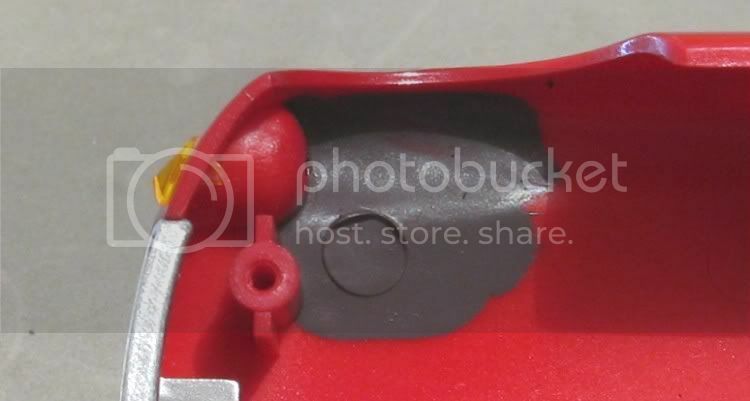 Scalextric have also anticipated light bleed from this area and have thoughtfully painted inside the body at these points with a flat grey to mask it. I wasn’t conscious of any light bleed on the laps I gave this model. The body mounting posts are quite small and as a precaution Mr Scaleyy has reinforced the fronts, which is good. There are four body screws and a couple of countersunk ones which go into the drivers tray. The screws are less than two gauge which has been the norm for most manufacturers for some years now. This only has implications if you drop one and loose it. 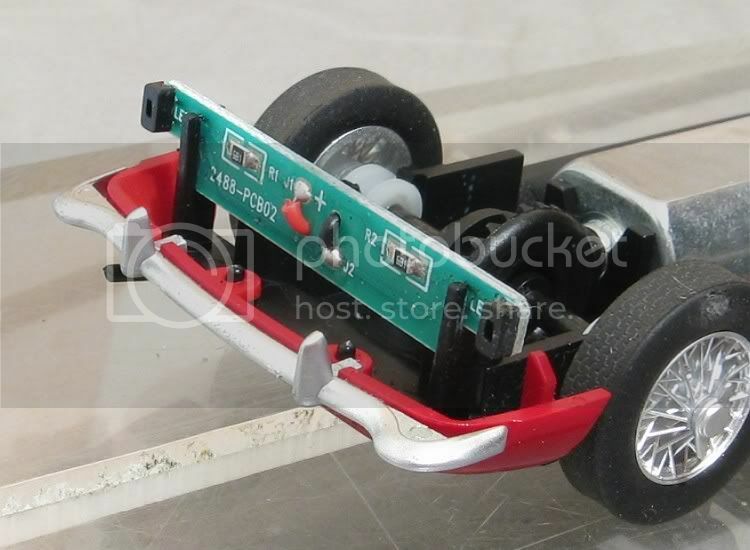 If you try and fit a regular slotcar body screw it may well not fit in the hole in the chassis. If it does, there is a real possibility that it will split the body post, so be careful. If you are taking the body off at a race meeting, do it over a bench or a race box so you don’t loose the screw! Once again, a familiar layout inside with room to spare. 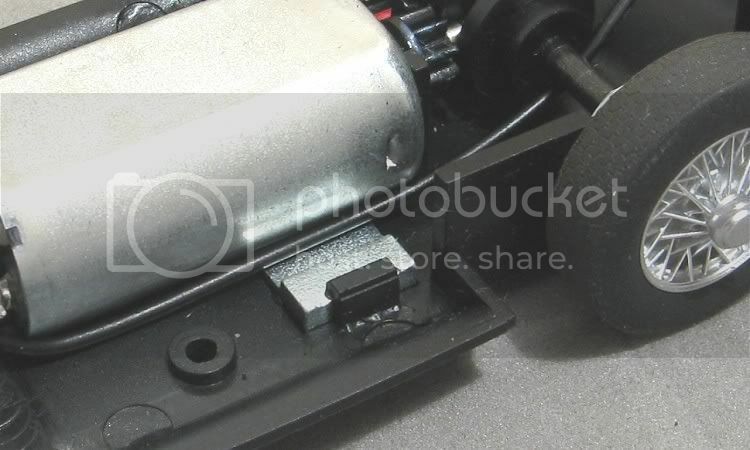 Scalextric have placed a stepped traction magnet under the motor in a very useful position. The motor is the 15,000 rpm version but it still propels the model along at a respectable speed. The rear axle is mounted in the now traditional nylon bushes while the front axle runs directly in the chassis material. Again it would have been nice to see less play in the axle bearings but as mentioned elsewhere, the axles have severe knurling on them to keep the wheels on, and the axle bushes need to be oversize to allow fitting over this knurling. But it’s not a big deal and running the model on a magnet track will see the model behave normally with the traction magnet taking slack from the drive train. So that’s the model, but does it go like it has been designed too? I have to admit that it is quite refreshing to put a model on the track straight out of the box and drive off into the distance without having to ponce about with half a dozen things which need attention before the model will behave itself. This car (and most of Scalextric’s products) is just such a car. In an age of innovation and design I still find it necessary to set cars up out of the box before I can race them. This model needs only the braid length adjusting before it is trackworthy, and that’s a thirty second job! I have had the opportunity to run it on a couple of tracks. One was a four lane board and magnabraid track, and the other was a short Scalextric Sport track layout. On the board track the model's tyres had no trouble hooking up with the ferrador surface and even though magnabraid has only about fifty percent downforce compared to a plastic track like Scalextric or Ninco, the model was still very sure footed and I had no qualms about trying some risky manoeuvres in the faster corners. On the Scalextric track it was obvious this was the models home turf. To watch it swishing around even some of the tighter bends was a bit reminiscent of the Revell Trabant on Ninco track, or should I say ‘rails’!! 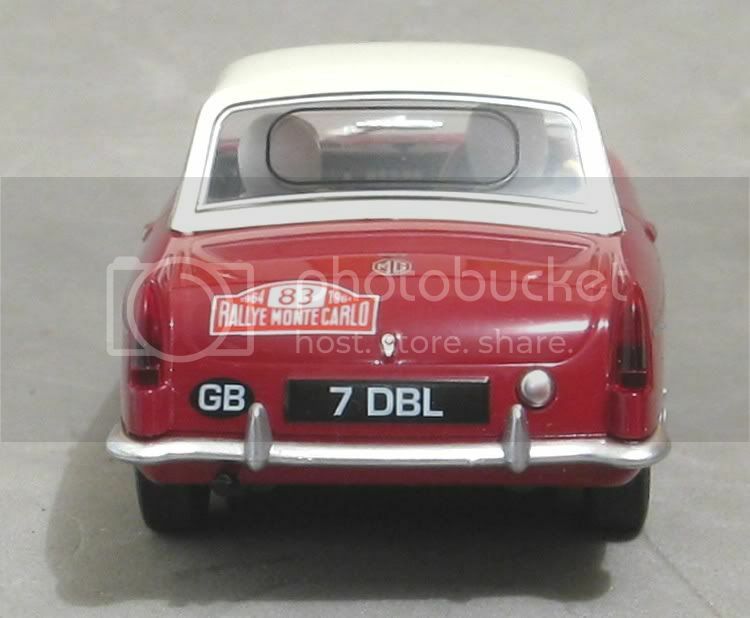 So, another nice model from Mr Scalextric and who knows what liveries are to follow? Maybe a sixties rag top, or one with the top down and a couple of twenty something’s on a day out in the country? Who knows! 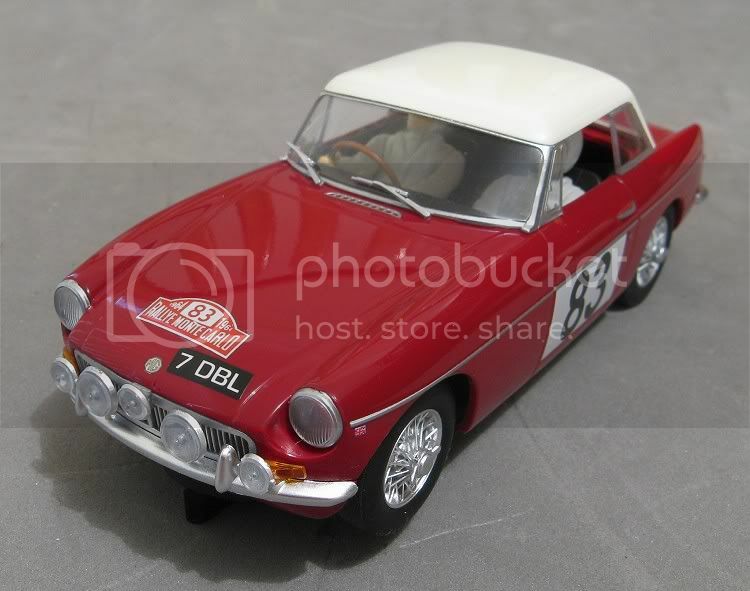 This is a fabulous little model and I defy any one over forty having a bad word for it. But, there is one thing that lets the model down in my book. Not a slotcar thing, and perhaps not a big deal, but all the same this model is touted as having super detail, which, for the most part it has!? Scaley have decided to install a couple of shady characters as driver and co driver. Both are very plain and apart from a flesh colouring to the faces, have no extra colour to them. But the worst offence to me (bearing in mind this may well be a shelf queen) is that they are very stiff and board like in place. After such a nice dash board (which, by the way, is less visible!) Mr Scaley could have at least gone to the trouble of picking out the clothing detail, furnishing the co-driver with a meaningful clip board and putting their heads in more realistic poses. As it is, it looks like they are gazing up at a passing pelican! So there you have it. The Scaley MGB according to Phil. I expect some may disagree with my findings, and that is their prerogative. But on a closing note I will go on the record as giving this model a very healthy 9½ out of ten. A great model AND a great slotcar!